Coolest Aladdin and Jasmine Couple Costume: I watch a lot of Disney movies at the age of 20 now like I did when I was younger… my boyfriend not so much. I really love the Disney movie Aladdin & I’m thankful my boyfriend would dress up with me, my friend couldn’t even get her boyfriend to dress as a pirate for Halloween so I do feel appreciated. My sister owns a sewing machine so we went to Wal-Mart spent $22 on fabric and thread and made the costumes together. I wanted the costumes to be almost exact – if you look on Google for Aladdin and Jasmine pictures, I believe her and I did a very good job. 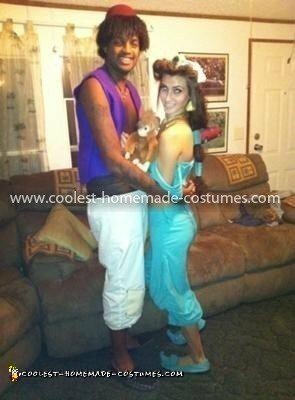 The patch on Aladdin’s knee and Jasmine’s shoes were hand sewed and the rest was hot-glued to a pair of black flats. My Jasmine diamond I painted with blue and clear nail polish to look shiny and real (the diamond was actually red so I had to obviously paint it). The necklace was a belt I wrapped good around my neck as her necklace. As for the earrings they were very creative – I made them out of yellow Crayola Model Magic, it’s an extremely light Playdoh I molded to the shape of her earrings and let dry a few days. Then I spray painted the Playdoh gold and I used real earring hooks so my earring holes would not become infected. Abu, Aladdin’s monkey however obviously was bought sometime years ago. When we wore our costumes out it was a huge hit, many people recognized who we were. 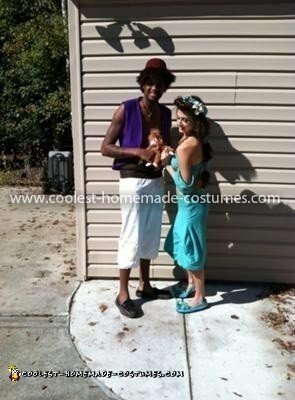 People thought they were expensive to buy, until I told them my sister and I handmade this Aladdin and Jasmine Couple Costume (instead of spending seventy dollars for each costume). I have more photos of our costumes being created if needed, I only submitted those four which you see because that’s all the site would let me submit. Making these was a nicely proud job well done with the smiles on people’s faces. I’m excited to see what we could think up next year!